Every win by a Mercedes-AMG Petronas Motorsport racing car is also a brilliant reminder of the Stuttgart brandʼs unique motorsport history. 2018 sees Mercedes-Benz celebrating a whole series of such outstanding events under the banner “Record addicts and driving champions” at various venues, including the Techno Classica show in Essen (21 to 25 March 2018). The anniversaries range from the one-two-three win in the 1908 French Grand Prix to Lewis Hamiltonʼs first world championship for Vodafone McLaren-Mercedes in 2008. Following four double championship wins in a row for Mercedes-AMG Petronas Motorsport, in 2018 Hamilton and his teammate Valtteri Bottas have the chance to claim the fifth Formula 1 driversʼ and constructors’ title since 2014. The history of motorsport victories by Mercedes-Benz and its predecessor brands is almost as long as that of the automobile itself. Vehicles with Daimler engines dominated many early automobile races in France, for example, the Marseilles–Nice race over 226 kilometres on 6 March 1898 (one-two-three win) and the Paris–Bordeaux race covering 573 kilometres on 11 and 12 May 1898 (victory by René de Knyff). Daimler also notched up wins in 1898 in the Berlin–Leipzig–Berlin long-distance tour and the first Dolomites tour. Further milestones in motorsport history were achieved 110 years ago – with Daimler-Motoren-Gesellschaft (DMG) and Benz & Cie still competing as rivals: DMG won the yearʼs most important race, the French Grand Prix. Benz & Cie. was victorious in the no less prestigious first Prince Heinrich Tour. And Victor Hémery won the Saint Petersburg to Moscow race over 686 kilometres in a Benz 120 hp on 1 June 1908, setting a new record for the course in the process. The Prince Heinrich Tour caused a particular sensation in Germany. This competition, which took place from 1908 to 1910, was launched by Prince Heinrich of Prussia, brother of the German emperor and an automobile enthusiast. The premiere of the international tour from 9 to 11 June 1908 covered a distance of 2201 kilometres. With a total of 129 vehicles competing, the tour was won by Fritz Erle in a Benz 7.5-litre special touring car rated at 37 kW (50 hp). Fritz Erle (number 68) won the first Prince Heinrich Tour in a 50 hp Benz special touring car. The tour covered 2201 kilometres from 9 to 17 June 1908, taking in Berlin, Stettin, Kiel, Hamburg, Hanover, Cologne and Trier on the way to Frankfurt/Main. Benz & Cie. fielded a total of eleven vehicles in the first Prince Heinrich Tour. Just a few weeks later, DMG and Benz & Cie. dominated the French Grand Prix. 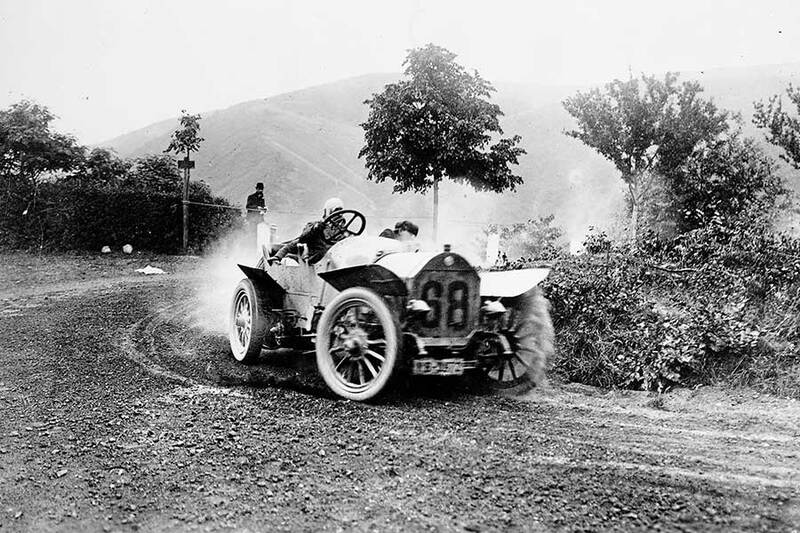 This “Grand Prix de l’Automobile-Club de France” succeeded the international Gordon Bennett race as the leading international motorsport event in 1906. On 7 July 1908 Christian Lautenschlager was first across the finishing line in the 140 hp Mercedes Grand Prix racing car, ahead of Victor Hémery and René Hanriot in their Benz 120 hp racing cars. The two German companies, which were to merge to form Daimler-Benz AG with the Mercedes-Benz brand in 1926, thus took first, second and third places. 90 years ago, Mercedes-Benz scored a stunning one-two-three victory with the new SS supercharged sports car (W 06) in the German Grand Prix at the Nürburgring on 15 July 1928. Rudolf Caracciola and Christian Werner won the event, ahead of Otto Merz and the Christian Werner / Willy Walb team. As the drivers took turns behind the wheel in theprevailing hot weather, Wernerʼs name appears twice. In the racing version, the vehicle with a 7.1-litre six-cylinder in-line engine delivered an output of up to 184 kW (250 hp) when the supercharger was active. The SS had previously chalked up its first victory at the Baden-Baden automobile tournament at Bühler Höhe on 29 June 1928. At the wheel: Rudolf Caracciola. On 29 July 1928 Mercedes-Benz fielded the legendary SSK for the first time in the Gabelbach race, and it was once again Rudolf Caracciola who wasted no time in setting a new course record in this premiere. It was behind the wheel of this racing sports car developed from the SS model and featuring a shorter wheelbase that he also clocked up a new record to win the racing car class in the International ADAC Schauinsland Hill Climb Race. 80 years ago Rudolf Caracciola won the 1938 Grand Prix season, becoming European champion in Mercedes-Benzʼs Silver Arrows for the third time after 1935 and 1937. The Stuttgart-based brand developed a new racing car for this season on the basis of the new rules introduced by the Association Internationale des Automobile Clubs Reconnus (AIACR). The W 154 was powered by a V12 engine with a displacement of 2962 cc and supercharging which delivered up to 333 kW (453 hp) in its first season. In 1938 Caracciola won the Coppa Acerbo at Pescara and the Swiss Grand Prix at the Bremgarten circuit, also coming in second three times (twice together with Hermann Lang) and taking two 3rd places (once together with Manfred von Brauchitsch). The Swiss Grand Prix, 21 August 1938. 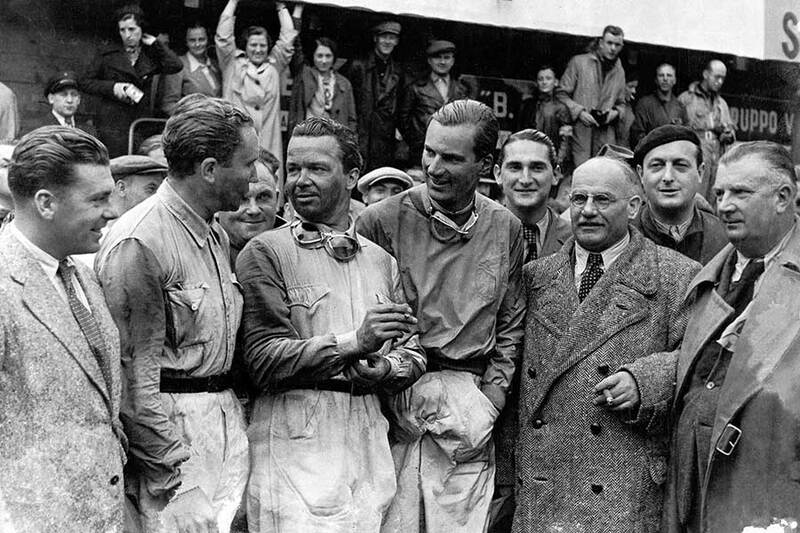 From the left: Rudolf Uhlenhaut, Manfred von Brauchitsch (3rd place), winner Rudolf Caracciola, John Richard Beattie Seaman (2nd place), director Max Sailer and race manager Alfred Neubauer. 40 years ago Mercedes-Benz dominated the long-distance rally “ Vuelta a la América del Sud”, which was staged from 17 to 24 September 1978, with a stunning performance that saw it take the first five places. Andrew Cowan and Colin Malkin crossed the finishing line first, ahead of Sobieslaw Zasada and Andrzej Zembruski (both teams competing in the Mercedes-Benz 450 SLC rally vehicle) and Tony Fowkes and Klaus Kaiser in a Mercedes-Benz 280 E (W 123). In the following years, the near-series V8 Coupés of the C 107 model series also made the running in the African Bandama rally. 30 years ago, Mercedes-Benz officially entered the sports car world championship in 1988. The involvement in sports car prototypes Group C marked the Stuttgart brand’s return to the race circuit. Five years earlier, in 1984, the company had signed a partnership agreement with Peter Sauberʼs Swiss racing team, under which Mercedes-Benz was to deliver the engines for the Sauber teamʼs racing cars. In 1985 Sauber presented the C 8, which was powered by the Mercedes-Benz M 117 V8 engine. The C 9 was introduced in 1987 and officially included the name “Mercedes” in its model designation (initially Kouros-Mercedes C 9, as of 1988 Sauber-Mercedes C 9). With more than 515 kW (700 hp) of engine power, the Sauber-Mercedes C 9 won the German Super Cup racing series in the 1988 season, clocking up its first win on 29 May 1988 at the Hockenheimring. Sauber-Mercedes was also victorious in five world championship meetings: the 800-kilometer race around Jerez (Spain), the Czechoslovakian Grand Prix in Brno, the ADAC 1000-kilometre race at the Nürburgring, the 1000-kilometre Spa-Francorchamps race and the Lucas Supersprint at Sandown Park (Australia), where Jean-Louis Schlesser and Jochen Mass crossed the finishing line ahead of their teammates Mauro Baldi and Stefan Johansson. In the following year, Sauber-Mercedes finally won the world championship with the C 9. The year 1988 also saw Mercedes-Benz officially take part in the German Touring Car Championship (DTM) for the first time. Five teams competed in the Mercedes-Benz 190 E 2.3-16 Group A, backed up by factory support from the Stuttgart brand. Roland Asch was runner-up in the DTM Championship at the first attempt in 1988. 20 years ago, in 1998, Mercedes-Benz took the FIA GT title for the second time. The duo Klaus Ludwig and Ricardo Zonta were crowned champions after notching up 5 wins and 4 second places in the AMG Mercedes CLK-GTR and CLK-LM racing touring cars. Together with the other driver teams, AMG Mercedes actually won all ten races of the 1998 season and clearly dominated the brand rankings. Its track record in this season included a one-two-three win in Oschersleben on 12 April 1998 and six one-two finishes. The CLK-GTR powered by a V12 engine was the winning vehicle in 1997. From the third race of the 1998 season it was replaced by the CLK-LM with a V8 engine which was originally developed for the 24-hour race in Le Mans. Klaus Ludwig and Ricardo Zonta won the FIA GT championship in 1998. 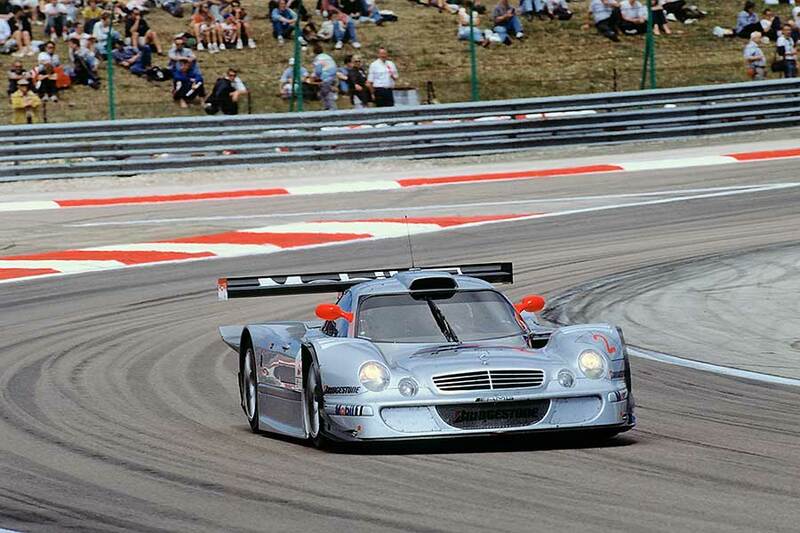 They won the fourth race of the season in Dijon on 12 July 1998 in an AMG Mercedes CLK-LM. 25 years ago Daimler-Benz AG, as it was then known, decided to acquire an interest in British racing engine manufacturer Ilmor Engineering. This was an important move with regard to its return to Formula 1, the premier racing series. By 1994, Mercedes-Benzʼs involvement had been stepped up to cover Formula 1 and the 500-mile race in Indianapolis (USA). In 1995 Mercedes-Benz became the engine partner of the long-established McLaren racing team. 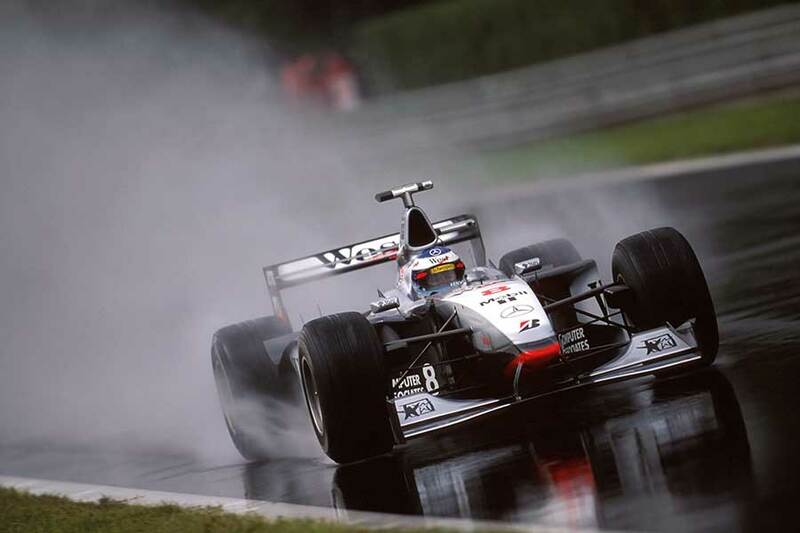 20 years ago, in 1998, this partnership spawned its first major success: Mika Häkkinen became Formula 1 world champion in the McLaren-Mercedes MP4/13 Formula 1 racing car, and the West McLaren-Mercedes team won the constructorsʼ world championship. Ten years later, in 2008, Lewis Hamilton won his first Formula 1 world championship, racing for the Vodafone McLaren-Mercedes team in the MP 4-23. Following Mercedes-Benzʼs return to Formula 1 with its own works team, Hamilton won the driversʼ world championships for Mercedes-AMG Petronas Motorsport in 2014, 2015 and 2017. In 2016 Nico Rosberg became the first German driver to win the Formula 1 world championship at the wheel of a Mercedes-Benz Silver Arrow.